The University of La Verne Debate Team earned top honors at the UCLA Invitational Tournament on Nov. 10-11. 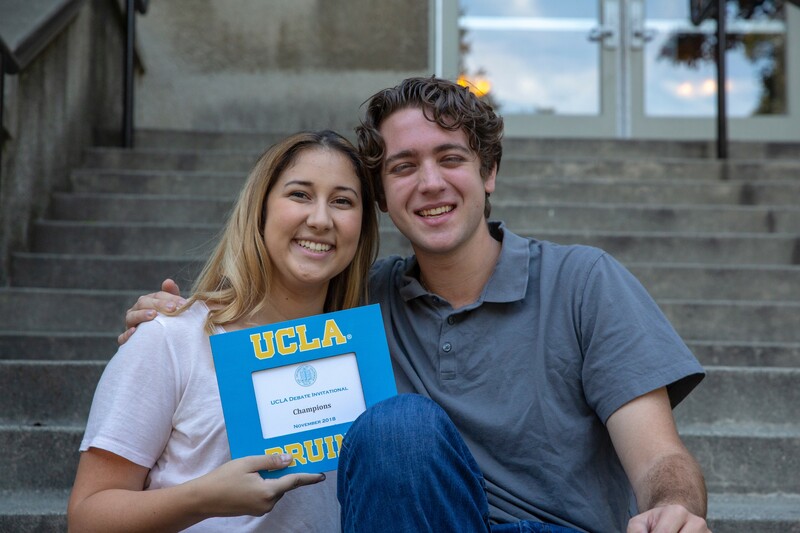 Seniors Michael Eberle and Sarah Osuna took first place in the open division of the competition, which was held on the campus of the University of California Los Angeles. Sophomore Adam Pepper and freshman Alondra Campos took second place. The final round included four two-person teams. “It’s not normative to have half the final from one school,” said Rob Ruiz, director of forensics and interim chair of the university’s Speech Communication Department. Competing schools included University of Alaska; the University of Denver; University of Southern California; UCLA; University of California Berkeley; and Point Loma Nazarene University. In the novice division, freshman Mason Stackman and junior Christian Nunez also reached the finals. The Leopards’ trophy case is filling up fast this year. In October, sophomore Jonas Poggi and freshman Noor Tabba beat UCLA at Politicon, which was held at the Los Angeles Convention Center. Junior Fares Abdullah and sophomore Adam Pepper took first place in the open division of the Rocky Mountain Debate Championship held at the University of Denver. Debate Team members traveled to Vermont on Nov. 3-4 to participate in the Huber Debates at the University of Vermont. Eberle and Abdullah advanced to the finals. In the novice division, freshmen Stackman and Tabba also reached the finals. The Vermont tournament drew east coast teams from universities such as Cornell, Clemson, and Rochester, and some western colleges including the United States Air Force Academy and the Claremont Colleges. The University of La Verne Debate Team has participated in four tournaments this academic year and has reached the finals each time, Ruiz said. “We have a very good team this year. It’s incredible,” he said. Debate Team members have talent, but they also are committed to putting in the time and effort to be serious contenders. That means preparing and practicing regularly – event after they’ve spent long hours traveling – in order to be at the top of their game. Eberle and Osuna attribute the team’s success to a number of factors, one of them being the camaraderie that exists among team members. Students know each other, spend time together, and are a source of support and encouragement, said Osuna, a speech communication and political science major. That fellowship is extended to opposing teams. University of La Verne debaters take the time chat with opponents about their majors, their interests, and topics outside of debate, Osuna said. But what happens when the competition begins? “We all wish each other the best,” said Eberle, a sociology major. During competition, the team approaches debate as thoughtful discussion in search of truth. Pictured above: Seniors Sarah Osuna and Michael Eberle of the University of La Verne Debate Team.